Costa Cruises, which began as a fleet of freighters transporting fabrics and olive oil between Genoa and Sardinia in the mid-1800s, became a fully owned subsidiary of Carnival Corp. in 2000. But it's still an Italian company with a modern fleet of ships, destination-intensive worldwide itineraries and a distinct Italian personality. 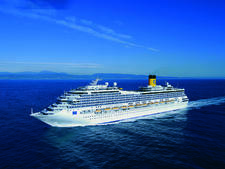 The Costa fleet sails under the "Italy's Finest" banner; its international family of ships spans the globe offering cruises of five days and longer throughout the Caribbean, the Mediterranean, Northern Europe, the Arabian Gulf, Asia, the Indian Ocean, China and trans-Atlantic. Some passengers have disliked Costa because of the extensive smoking aboard their ships, but following Italian government regulations ashore, all internal areas of the ship, with the exception of designated cigar lounges, are smoke-free. Travelers enjoy the uniquely European atmosphere -- after all, Mediterranean-influenced cuisine, regional wines and warm, rich decor are all part of the Italian tradition. Alas, Italian stewards, part of the line's heritage, are no more. Cabin and dining room stewards are now as multinational as the passengers, with Filipinos, Indonesians, South Americans and Indians in the mix. As they speak English, the former criticism of English-speakers that they were not understood has been ameliorated. Costa Cruises is well-known for its Italian ambience onboard, vibrant entertainment and Samsara Spa, one of the best at sea. The line launched its first passenger ship in 1948 and soon placed an emphasis on its fleet's furnishings and architecture, traits that continue today (indeed, its newest ships feature millions of dollars in original artwork and hand-crafted flourishes). In recent years, Costa has vastly upgraded its Squok Club, its kid-friendly programming. Its culinary offerings, updated in 2015 with help from Costa's Michelin-Star Chef Fabio Cucchelli, reflect typical Italian cuisine. The line also partnered with Italian brands Barilla, Illy Caffe, Nutella and Ferrari wines, all part of the its "Italy's Finest" initiative. 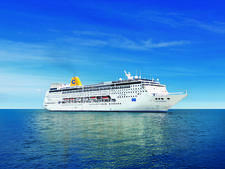 There's no question: Costa Cruises is a European experience that primarily is geared toward Europeans. But those who enjoy traveling with passengers from a variety of cultures, speak a variety of languages and value the competitive pricing will find this a line worth checking out. On European itineraries, Costa attracts mostly European passengers from Italy, France, Germany, Spain, Portugal and the U.K. On an average winter sailing in Europe, about 10 percent of passengers are from North America. During the summer in Europe, about 20 percent of passengers will be North Americans. On Caribbean cruises, the demographics are still geared strongly toward European travelers with a healthy smattering of North Americans. Cruises originating in Chinese ports cater primarily to Chinese passengers. Costa's ships also appeal to a wide range of ages, from 20-something first-time cruisers to retirees, but its fun, active vibe attracts a strong family audience as well as 40-something (and younger) couples. Since the 1990s, Costa has embarked on quite an ambitious program that targets newbuilds and extensive refurbishments of older vessels. Costa has benefited from its Carnival Corporation ownership in the expanded fleet department. 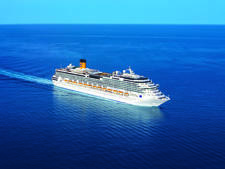 And as the line embraced its largest-in-history fleet expansion, Costa debuted Costa Mediterranea, a sister ship to Costa Atlantica, in June 2003. Costa Fortuna was launched in November 2003. The 105,000-ton, 2,720-passenger ship was at the time the largest ever to fly the Italian flag; Costa Magica, its sister ship, premiered in November 2004. The ill-fated Costa Concordia, a sister ship, was launched in July 2006. It capsized in January 2012 off the coast of the small Italian island of Giglio. 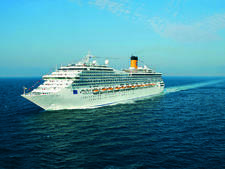 In May 2007, Concordia was joined by sister ship Costa Serena, and in June 2009, Costa Pacifica joined the siblings. But 2009 also brought the first of a new prototype. The 2,260-passenger Costa Luminosa is actually smaller than its siblings and is meant to be an upmarket twist on the Costa experience. Costa Deliziosa, a sister ship, joined Costa's fleet in January 2010. Two more ships -- which are fleetmates to the Costa Concordia design family -- also debuted; Costa Favolosa premiered in July 2011, while Costa Fascinosa launched in 2012. In addition, Costa Diadema, a new flagship debuted in November 2014. "The Queen of the Mediterranean," or Regina del Mediterraneo, is the largest cruise ship flying the Italian flag at 132,500 gross tonnage and a total passenger capacity of 4,947 (3,693 passengers at double occupancy). It is the same shape and size as Carnival's Dream Class of ship and is the biggest, most spacious and most modern ship in the Costa fleet, in terms of the services, decor and overall design. In July 2015, Costa announced an order for two next-generation cruise ships with the largest passenger capacity in the world. They will be the first ships in the cruise industry (together with two new ships announced for AIDA Cruises, Costa Group's German brand) to be powered by liquefied natural gas, a clean-burning fossil fuel. The two ships will be built at the Meyer-Werft shipyard in Turku, Finland, with delivery in 2019 and 2020. Costa has also embarked on an ambitious refurbishment program for its older ships. The 75,166-ton, 1,928-passenger Costa Victoria, one of the line's China-based ships, underwent a significant upgrade in 2013 that resulted in the addition of balconies, new dining venues and other enhancements. In April 2015, the line redeployed Costa Serena to Shanghai. In April 2016, Costa Fortuna will become Costa's fourth ship in the region. Costa has also spent $129 million on turning three of its ships into "neo" ships for the line's neoCollection cruises, which began with Grand Mistral from Carnival Corp., sister line Iberocruceros. 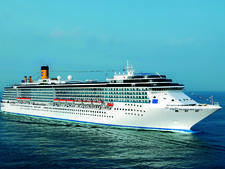 After a refurbishment, the 48.200-ton 1,248-passenger ship, called Costa neoRiviera, received upgrades to public areas. It joins Costa neoRomantica and -- after another radical refurbishment program -- Costa Classica, which was renamed Costa neoClassica, and joined the fleet in December 2014.